Ted Cruz's image among Republicans has deteriorated in recent days. At several points in late December/early January, Cruz had a net favorable rating of +48 among Republicans and Republican-leaning independents. 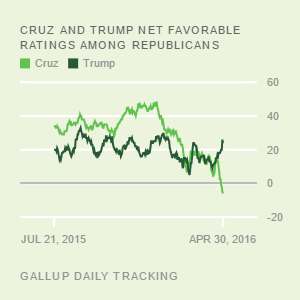 At this time, Cruz's net favorable rating was the most positive image of any of the GOP candidates Gallup is tracking. Now, Cruz's positives are falling and his negatives rising, and his net favorable rating has plummeted 16 percentage points down to +32. Cruz's current favorable rating among Republicans is 55%, down from 64% less than a month ago, and his unfavorable rating has risen from 16% to 23%. As is always the case with changes in survey measures, it is hard to be specific about the precise causes of change. One factor that undoubtedly has played a part in the process is Cruz's public fighting with Donald Trump, resulting in Trump criticizing the Texas senator over such things as his not being born in the U.S. -- and thus the possible unconstitutionality of his becoming president -- his barbs aimed at "New York values" (where Trump of course lives and works), and his being unpopular with the people he has worked with. On the latter point, Trump said in a CNN interview Monday that Cruz is a "nasty guy who can't get along with anybody." Trump's net favorable score has been fairly steady even as Cruz's has deteriorated -- although Trump's too is down slightly in the most recent two-week average ending Jan. 24. Cruz may also be suffering from the mere fact that he is more in the limelight and, therefore, more in the crosshairs of media reporters and various commentators. The results of that process may be to highlight sides of Cruz not previously seen. I compared Cruz's and Trump's image among conservative and moderate/liberal Republicans from Dec. 28-Jan. 12 (when Cruz was at his high point) to the recent Jan. 11-Jan. 24 time period. The sample sizes for these subgroups are small, but while Cruz lost ground among both groups of Republicans, Trump actually gained among conservative Republicans. Cruz had a 25-point advantage over Trump in the earlier time period among conservative Republicans, but in the recent data, that has shrunk to seven points. As you can see from the chart, Cruz's image among Republicans remained relatively stable from July through November, when it began to become more positive. Now, in what we might call "phase three," Cruz's image has basically returned to where it was. Cruz has become somewhat better known over this time period. In mid-July, about two-thirds of Republicans knew enough about him to have an opinion. Now, about eight in 10 have an opinion of the senator. Trump's image has generally been up and down over the past six months but in a relatively constrained range. His current net favorable rating of +27 is slightly above his overall average of +22, but below the several points at which his net favorable rating was in the low-30% range. 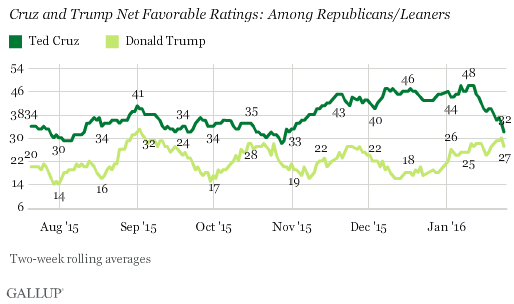 Despite his recent losses, Cruz's net favorable rating has, at any given time, never been lower than Trump's. This reflects, in part, Trump's negative baggage, with unfavorable percentages in the 30% range since measurement began. Cruz's unfavorable percentage has been consistently lower, mainly in the teens, but has edged into the 20% range in recent weeks. These image assessments are based on a random sample of all Republicans nationwide and, of course, don't reflect how those Republicans living in Iowa and New Hampshire -- who have been immersed in candidate appearances, media news coverage, advertisements and direct contacts -- feel about the candidates. Further, a candidate's image in Republicans' eyes does not necessarily predict how successful that candidate is at motivating people to come out and vote for them. As a case in point, with Cruz's drop in his net favorable rating, and concurrent slippage in Marco Rubio's image among Republicans, physician Ben Carson now has returned to the point where he has a significantly more positive image than any other GOP candidate measured. (Carson's net favorable rating is +45, Cruz's +32, Rubio's +32 and Trump's +27). 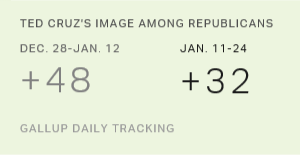 Plus, Mike Huckabee's image (+32) is now essentially at parity with Cruz's and Rubio's images among Republicans. Few observers expect either Carson or Huckabee to be the victor in Iowa or New Hampshire. Americans have stronger views on the downsides of a potential Donald Trump presidency than on the positives, and in particular cite the effect of his personality traits. His views on immigration and the economy are seen as both positives and negatives. Donald Trump's image among Democrats and independents is significantly more negative than any other major GOP candidate's. Republicans' views of Ted Cruz are now at a new low, with 39% viewing him favorably and 45% unfavorably. This reflects a steep slide in his image over the last couple of weeks. Donald Trump's image is up to +24 among Republicans.